After the US withdrawal from both the Paris Accord and Trans-Pacific Partnership, the Pacific Islands region is looking for reassurance from Australia and the US. The recent AUSMIN summit did produce a joint statement reaffirming US and Australian commitment to the region, but the South Pacific will need more. Many nations across the region are subject to geostrategic, domestic and non-traditional drivers of instability that load stress onto national and local systems, sometimes to crisis point. The question for Australia and the US is how to work best with partners in the region to increase their resilience to these stresses. As Jenny Hayward-Jones recently commented, ‘resilience’ has been a buzzword in the development community for a while now. Hayward-Jones highlights the incredible resilience already inherent in South Pacific communities, often forced to cope with natural disasters independent of government support and she rightly points out history has shown the people of the South Pacific to be fantastically resilient. Indeed, they have much to teach Australians on the subject. However, Australia does not often deal directly with the people of other sovereign nations. International partners must deal with local governments. This is especially the case when considering issues of security. As such, it is important to understand the systems that allow Pacific states to function. I want to propose a model for examining resilience and fragility within these systems that can guide security-focused policymakers. A nation-state is an excellent example of a complex adaptive system, in that it consists of many diverse and autonomous components that are interdependent in ways that make it hard to predict the outcomes of altering any one part of the system. As you can see in the resilience framework model below, each system, which incorporates subordinate sub-systems, can tolerate a certain amount of stress or shock but, if too much pressure is applied, the system will reach a threshold. At this point it will fail and the system will go into crisis. Usually, unless it is a truly black swan event, there will be a number of threshold indicators that, if picked up, will denote an increased likelihood of system failure. Once these are recognised, policy makers can be alerted to the probable impact of that system failing. They can also get timely and sound guidance as to the risks of allowing that system to fail, as well as the costs and risks associated with pre-emptive or post-crisis intervention. It is important to highlight at this point that, should Australia choose to intervene, it can do so at any point along the line; it does not have to wait until there is a crisis. Any intervention, be it pre-emptive or post-crisis, will have one of two aims: it will either seek to reduce the stresses on the system so that they no longer overwhelm the system, in effect returning the conditions to pre-crisis levels, or it will attempt to make the system more resilient. Preferably, any intervention should aim to increase system resilience, even if addressing the causes of a crisis. In the long run, it is increased resilience that will allow a nation to cope more effectively with future shocks and stresses. The timing of any intervention is important for two reasons. Firstly, and critical for policy makers, is the cost differential between pre-emptive and restorative intervention. A good example is the cost of Britain’s intervention in the Balkans. The then-Foreign Secretary of the UK, Jack Straw, highlighted in a speech in 2002 that intervention in Bosnia, which only occurred after multiple systems had passed their thresholds and the nation had failed to function as a state, cost the British taxpayer at least £1.5 billion. In comparison, the intervention in Kosovo, which occurred at the point of crisis, cost £200 million while the pre-emptive intervention in Macedonia, which occurred when threshold indicators suggested systems were approaching crisis, cost just £14 million. Second, it must be noted that the risks, and costs, of both intervention and declining to intervene are not just financial. 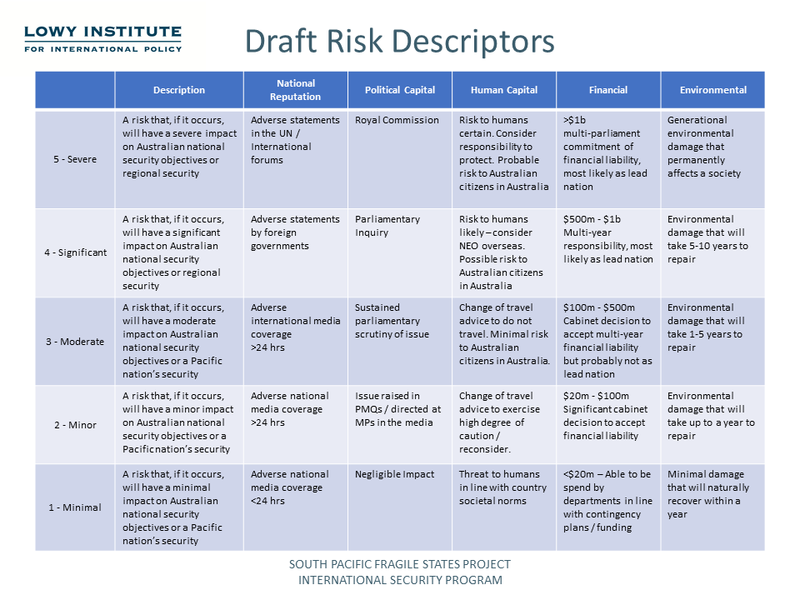 The risk descriptors outlined below are an attempt to articulate the impact of that risk to the Australian government across five categories: national reputation; political capital; human capital; financial cost; and environmental impact. The other important aspect of timing is detecting when the environment is ‘ripe’ for intervention. The theory of conflict ripeness suggests parties to conflict only resolve their issues when they are ready to do so, usually when other options that would give them a more favourable outcome have been exhausted. In other words, this is the art of identifying and seizing the point where a stalemate is reached and parties are willing to accept an intervention. This is very much a qualitative judgement, best made by experienced observers on the ground. It is also worth highlighting that if some environments are ripe for intervention, others will be ‘unripe’. Intervention in unripe environments are likely to be ill-received and may even exacerbate problems. When confronted with decisions about resilience and fragility in the South Pacific, policy-makers can benefit from considering this model. It focuses on identification of threshold indicators, and it also articulates risk holistically. Most importantly, it forces decision-makers to compare the pre-emptive costs of intervention against the cost of restorative intervention.